Unbelievable withdrawals conditions at Zoomtrader.com. Recently we’ve seen a lot of people promoting Zoomtrader as a good binary options broker, but the reality is completely different. 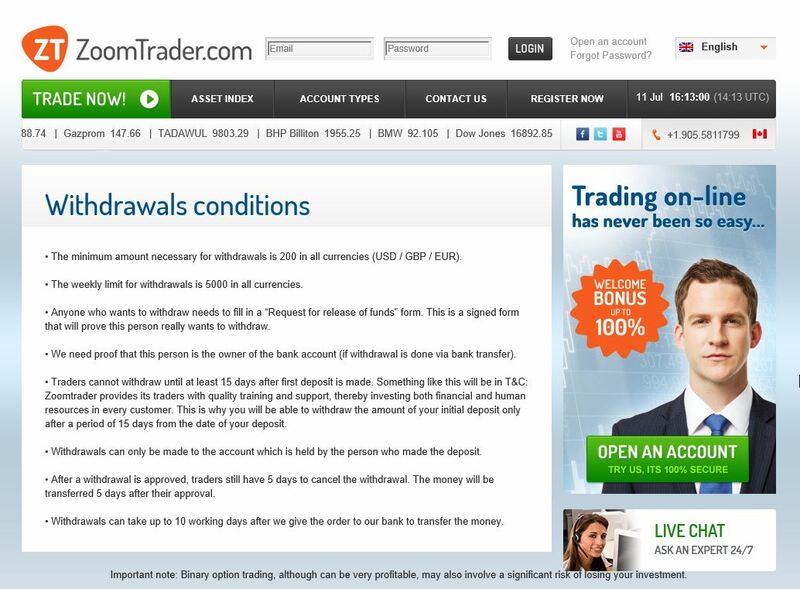 In fact we have received a lot of complaints about Zoomtrader, people are saying they are scam. The complaints were mainly about difficulties to withdraw money. A lot of traders deposit money and never see it again. While we cannot verify if such claims are true, there are so many complaining people about Zoomtrader, that something must be seriously wrong with this binary options broker. The first sign of warning comes from the fact that Zoomtrader is not regulated. They used to be based on Cyprus, where they would have to be regulated by the CySec, so they moved to the British Anguilla, where they are basically uncontrolled. By the way, the CySec gave them a fine anyway for offering binary options on Cyprus without a license. But let’s continue, when we look at the Terms and Conditions, we cannot believe that something like that can be legal anywhere. In our opinion it is a scam, because they basically do everything they can to prevent you withdrawing your money. Let’s take a look. That means that they basically can give you any price they want. So should you win a trade, they can say: ‘Oh, sorry, we are giving you this different price, which means that you lose your trade.’ So they can make you lose all your trades, if they want, they can manipulate everything like a casino, there are absolutely no rules and they say it openly. Another unbelievable condition concerns withdrawals. They say that „the minimum amount necessary for withdrawals is 200 in all currencies.“ And guess what, the minimum deposit is also 200, so if you make just one losing trade, you cannot withdraw the rest of your money back until you deposit again. To further complicate withdrawals, you will not be able to withdraw anything, not even your deposit, until you execute trades in an amount of at least 40 times the bonus you were given when depositing money. Blocking deposit withdrawals by bonuses has been declared illegal by the CySec, but as Zoomtrader is not regulated, they can do anything they want. And if you think that you can avoid this by not accepting bonuses, there is this sentence in the TOS: „Furthermore, we may, at our sole discretion, credit the user with up to one hundred percent (100%) bonus for each deposit made by the user.“ So there you go, they can force you a bonus whenever they want, which will block all your withdrawals. As you can se, they do literally everything they can to keep your money. Their conditions about withdrawals are unseen, this is something impossible with serious binary options brokers. So if you want to trade, stay away from Zoomtrader, that is our advice. My advise out there is for you to be wise before you invest in any binary option broker I was scammed 250k by online broker. WARNING: THE BITCOINCODE AND ZOOMTRADER ARE FRAUDULOUS WEBSITES! their Cashier Zoomtrader England one has to select between “autotrading” and “manual trading”. With the first trading one is accepting automatically (TRAP!) the Rules and Conditions of Zoomtrader, especially paragraphs 2., 18., 19., 21. and 43. Paragraph 2: By creating an account and using Zoomtrader’s website you automatically are accepting their Terms&Conditions! as additional working capital, without informing you. on half-way or less the „trading capital“ will come to zero and you cannot continue trading! Then latest you realize: YOUR MONEY IS LOST! The first „Trading-Consultant“ executed a few successful tradings with me within a limited time of abt. 5 minutes only, mentioning that his time is very precious having other big business going on. He said: „Only if you will pay to Zoomtrader bigger funds I will do with you the „real big business“ where every party can earn. I must earn money for my career. Otherwise I will stop trading with you“. He did it. Then another „Consultant“ in Zoomtrader called me. He made 1 trade with me and thereafter he started the same game with me: asking for more „capital“ money to pay for the „real big business“ because he, too, has to earn money. Otherwise he would stop trading with me. He did it and said that he will return the trading with me to the first Consultant. To both of them I confirmed many times that I do not have more money to pay to Zoomtrader. Bitcoin Code and their Broker Zoomtrader (same software!) are promising in their Websites that one will earn money by signing in and investing some money as trading capital. and of no concern to the client, naturally. will be gone and nothing left to continue trading! 12.000$. It would take 10 months to reach the requested Bonus transactions of 120.000$ . By their adding a FRAUDULOUS Bonus behind each payment the CHEATING will continue. Bitcoincode and the Consultants of Zoomtrader are promising in their websites: „Your money is safe with us and you always can claim it back“. This is a BIG LIE! In paragraph 43. of the Terms and Conditions, for withdrawal a „Form“ must be filled out. In the lower half, however, is marked: *Funds for withdrawal are subject to the Bonus Terms&Conditions“. TRAP again! Was the name of that “Consultant” Daniel Steven? That was the arsehlole who ripped me!..Daniel Steven..prick!